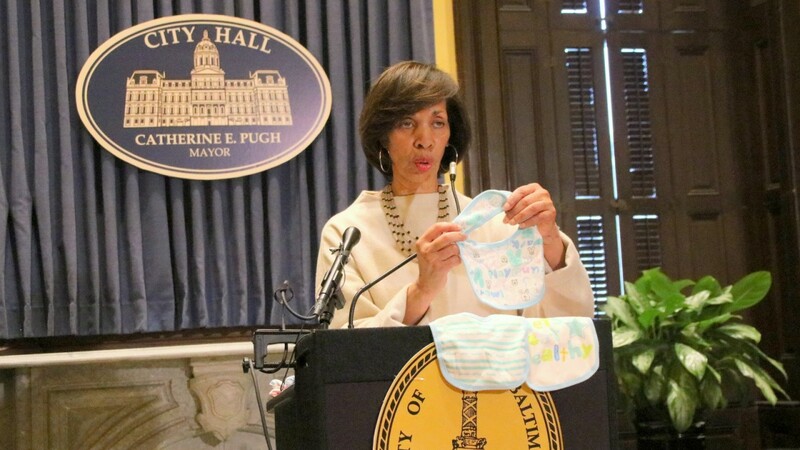 Brandishing shipping documents one minute and exercise-themed baby clothes the next, Mayor Catherine Pugh faced the media to talk about her half-million-dollar “Healthy Holly” book deal with the University of Maryland Medical System (UMMS). She led off with some barely audible words of remorse. “I want to apologize that I’ve done something to upset the people,” she said yesterday in a hoarse whisper. But there was also finger pointing. City School officials have said they could only find 8,700 of the mayor’s self-published children’s books – in a warehouse which they have refused to let a reporter see – and could find no documentation for the one shipment of books that staff remembered about five years ago. But Pugh said the school system received tens of thousands of the books and concluded her remarks yesterday by throwing the ball back to North Avenue. “I do hope that we find out from the school system where the rest of those books are,” she said. She then alluded to the possible legal jeopardy she may be facing from the book scandal. It was a halting performance by a chief executive who usually maintains a steely command of press availabilities and keeps her remarks upbeat and flowing. The first document she described was a January 12, 2011 letter from a UMMS vice president, Jerry Wollman to Sonja Santelises, then chief academic officer for Baltimore City Public Schools. Shipping manifests show 20,000 books delivered to school headquarters on North Avenue on June 10, 2011, while 2,090 were sent to Pugh’s district office “so I could walk around with those books to various schools,” as she put it. “Two years later, we produced just over 21,000 more books – ‘Healthy Holly: A Healthy Start for Herbie,’” Pugh said, continuing her narrative. The March 28, 2013 shipping bill provided to reporters shows 1,500 were printed separately for Pugh, while the other 18,600 books were delivered to North Avenue. The August 25, 2015 order for the third book in the series, “Healthy Holly: Fruits Come in Colors Like the Rainbow,” according to documents Pugh provided, showed 1,500 books went to her campaign committee address and 19,500 to City Schools. As for the fourth title, “Healthy Holly: Vegetables are not Just Green,” Pugh acknowledged that she was paid $100,000 by UMMS, but the books were not shipped. She did not explain why those books never appeared in Baltimore. As the mayor previously said, the fifth book in the series was canceled and she has returned the money to UMMS. Why? “Because the person who does our layout [of] our book was very ill. . . and we have no date for her proposed return and she is undergoing a prolonged rehabilitation,” Pugh said. She’s in the 2018 city employees database as a $66,300 executive assistant in the mayor’s office, hired on September 11, 20i7. Green has not returned phone calls from The Brew. A spokesman for Pugh said she left the mayor’s office for a job at the Department of Public Works. 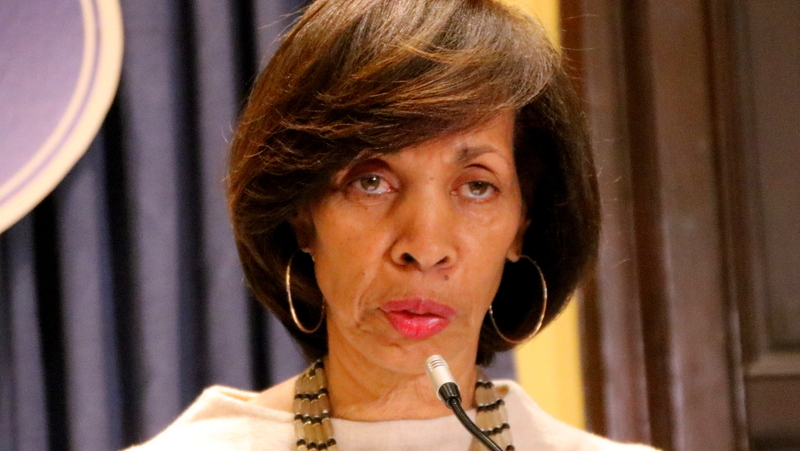 School officials said it was too early to respond to Pugh’s statements about UMMS having shipped roughly 58,000 books to them in recent years. That number is far different from the 8,700 books that school officials say they have tracked down in the Pulaski Highway warehouse. “As we have indicated, City Schools has not located documentation of receipt of books,” spokesperson Anne Fullerton said last night. Pugh has plans for those warehoused books. “I am making arrangements to retrieve those books in order to make them available to children in our community,” she told reporters. Other statements that she made yesterday were more puzzling. Among them was her assertion that there “was never a contract” with UMMS. For $500,000 in purchases? She also spoke about how someone on the UMMS board of directors suggested that the system buy the books from her. A reporter asked who it was, but Pugh wasn’t taking questions. What about the fact that she never reported the book payments – or her formation of Healthy Holly LLC – in ethics disclosure reports filed as a state senator? The matter never came up during her brief appearance. Ditto for how much Pugh made in profit on the deal – there was no discussion of how that $400,000 was used. Previously she said the books cost $4 each to compose, print and ship – and were sold to UMMS at a “modest” price of $5 per copy. But invoices, canceled checks or other documentation of her expenses weren’t part of her presentation. Pugh’s media strategist Gregory Tucker, who has said he would be leaving the job when his contract expires at the end of the month, appeared to be coordinating the event, along with spokesman James E. Bentley II. A significant portion of the news conference was taken up with the mayor displaying the infant clothes, bibs, a baby blanket and other merchandise she designed as part of her Healthy Holly business. They had been on a table hidden under a black cloth. They were uncovered by staffers who placed them carefully on the lectern for Pugh as she requested them. “As you can see from our bibs, it was about teaching children to walk, run, crawl, skip, dance,” she said, picking up the pastel blue and pink items one by one.